I recently attended a social media marketing conference, where one of the large agencies talked about Social Media 1.0 (happy Friday, everyone), 2.0 (six ways to save on insurance) and 3.0 (give us a ridiculous amount of money, so we can fly our entire creative crew to the Serengeti and film elephants romping and produce an eff off expensive advert that you can post onto social media, and we can win an award, and call it social media). That got me thinking. 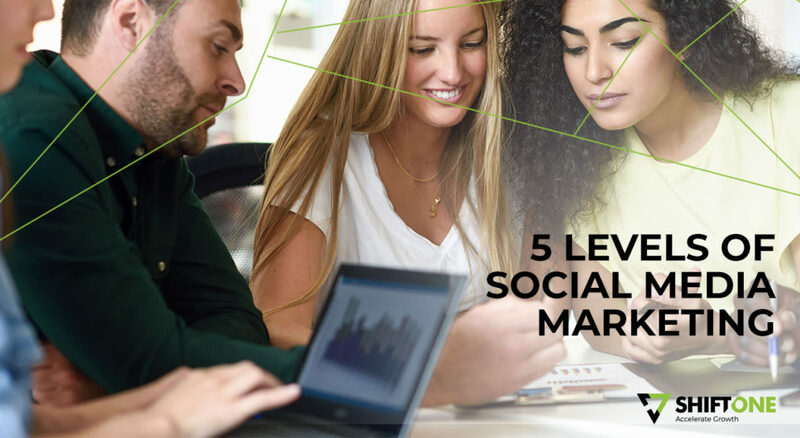 What are the levels of social media and what is the definition of Next Level Social Media? When I started Shift ONE digital six years ago, I’ll admit to you that, while I knew digital marketing backwards, I wasn’t very strong on social media marketing. I had to work each social channel out, and fast. Through the years my team has grown from just myself and an intern, to fifteen full-time, powerful, wonderful, beautiful staff members, highly skilled in what they do and who produce compelling and engaging content for our clients. This six-year journey has come with its fair share of learnings and epiphanies. One of the biggest revelations came shortly after deciding to build my personal brand on YouTube, Instagram, Twitter, Web, LinkedIn and Facebook. I wanted to turn myself into a digital influencer, simply to understand the journey and the steps to becoming internet famous. Nearly a year later, I would like to share with you all that I have learned. They don’t believe their customers are on social media, so what’s the point? Which platforms are your customers using? Can you master just one of these platforms? Spend 20 minutes a day on this platform, familiarise yourself with your competitors’ content and what your customers are talking about. Make sure you like posts and comment to increase awareness of your own brand. From there on, decide on a thought piece or post of your own that you can publish. Even if you only do one of the above actions, the great thing is this: it’s a 100% improvement from where your business is currently at. Oh, and don’t worry about making a mistake and the whole world laughing at you. I assure you, unless your post is racially charged, nobody will notice your blunder. So just starting doing one thing every day, and you’ll learn and grow from there. This is usually where companies start out, posting their products, specials and company information onto social media. After trying this for a couple of months, they complain that social media doesn’t work for them as they are not making sales from their efforts. Here’s the problem: it’s Social Media, not SALES Media. If you want to hard sell, hire a big ad agency to make a TV advert for you – maybe a family sitting around a table, the kid runs in, his shirt is dirty from playing soccer and WHAM! The mom pulls out the detergent and his shirt is white again. Social media won’t work with hard sell messaging, unless you have a product that sells itself, like Janine Binneman’s handmade jewellery. I can’t get enough of their finely crafted, proudly South African sparklers. Save the hard sell for outbound call centre staff who call at all hours trying to sell you a new cellphone or short-term insurance. Social media is made for social engagements, social content, and building community and relationships. Ever gone on a date with someone who won’t let you get a word in edgeways? That’s what this level is about. There’s no problem with that. The problem centres on not replying to comments, or copy-pasting generic responses to save time. I’ve been on so many social accounts, where followers are left out to dry, their lonely comments hanging in midair, like an ignored high-five. If you start becoming a regular on social media, it is imperative that you not only check your replies and comments, but you also engage back in a timely fashion. That’s what social media is made for. Social. Media. Ok, so you’ve ticked the box, and you’re producing content and posting it out regularly. ‘Me Too’ social media is basically your traditional content marketing. Companies on this level are posting more than just hard sell content or blah blah blah content on social media. They’re starting to post ‘Happy Friday’, or ‘What are you doing this weekend?’ posts. They might even go as far as writing a blog about ‘Seven Ways to Save Money’ or ‘Top Ice-Cream Parlors In Pretoria’. Nothing wrong with this. It’s necessary to go through this phase, just as it’s necessary to pass through the five stages of grieving. Usually on this level you start chasing likes – the vanity metric. Don’t get me wrong – likes are important if you’re a big, national brand. It’s expected for you to have at least a few tens of thousands of followers. So do that, get them, and then work out what you’re going to do with them. Why? Because social media likes don’t translate into sales. It’s not SALES media. It’s SOCIAL media. Content here is usually too glossy, and not very believable. That’s the basic flaw with most social media content plans – nobody believes you. Even though it’s soft sell, it’s still produced from your brand, for your brand, according to Neilsens. It’s not credible, but don’t stop! There’s no shame at this level, at least you are growing and moving up the social hierarchy. Just don’t get stuck here! Enlightenment is just a few posts away. When I started building my own brand, we created a product called Kingmake Me, where we turn thought leaders into digital influencers using video and social media. This then went on to expand into Visionmake Me, where we use video and social media to inspire and unite a business. We did this either by filming the senior management live out the vision and values, or filming staff or even customers interacting with the brand in their day-to-day lives. What I learned during this process, is that social media is designed for people, not brands. If brands want to be active on social media, they have to do it as individuals, not as brands. Sure, you can layer into your content plan the usual content marketing articles and images and videos, a few specials and products and hard sell posts, but you absolutely definitely also have to be using people (real people) in your posts. Real people in the form of your senior management, CEO, staff, customers or other influencers. And it has to be video. And the video has to be cool and edgy and vibey, showing what it’s like to be them, what it’s like to walk in their shoes, not dull boring ‘interview-style’. What’s great about this style of video is that the person being filmed gets used to the camera, and even forgets about it. Think of day one in the Big Brother house – the Jacuzzi starts heating up only a few hours into the first day, cameras, inhibitions, clothing and reputations all forgotten as the story takes over. Video communicates tone, body language and personality in a way that no other medium can. I can sense your mettle just by watching you on video. We’ve won clients just by having the Maggs on Media video on our home page. Video communicates AUTHENTICITY. You can’t fake it in front of a camera. And the great thing about creating authentic video content is that people want it to look ‘real’ and not glossy and over produced. Imagine, instead of creating an interview-style video of your vision for the year to share with your 3,000 staff members situated globally, our camera crews follow you for a day or two, filming your day, filming how you live the vision, how you live the values, and sharing that with your team daily. And that’s the thing… once you start making video, you can’t stop. You need to create daily snippets for your followers who want to connect with you, and feel a part of your vision, dream and day. Remember, it’s not unusual for millennials, even Gen Y (and a few of the really with-it Gen X’s) to form relationships digitally, and to not distinguish between virtual relationships and actual friendships. Influencer Marketing resides on this level. If you don’t want to be an influencer, then approach influencers. If you don’t want to produce this kind of content, then approach the many people who have built up a following, and ask them to collaborate. Get them to write a guest blog for you, sit on an expert panel, or review your product to their followers. The bad thing about influencer marketing is that it’s already starting to lose its shine. Followers stop believing posts, as influencers take money to promote brands, authenticity and trust are lost, and as a result, relationships are burned. Your community management has to go to the next level here too. You can’t simply reply to comments. We are talking Social Amplification here. Teams of people who are proactively building relationships, becoming friends with your followers. Live video is being prioritised over normal video by nearly all social platforms. Live video gives your customers and followers a chance to engage with you, face-to-face, virtually. Yes, that is a thing. Content on this highest level has to be credible, believable, authentic and build relationships. If you mix this in with your Me Too content marketing, then you are onto a winning formula. What’s next after Level Five? Funnily enough, we are going full circle: from hard sell in the 50’s, to soft sell in the 80’s, to content marketing in the 00’s to face-to-face, real, genuine, person-to-person connections in the 10’s. Virtual and augmented reality will bring you face-to-face with brands like no other technology. Whatever’s next is going to be more relationship driven, more personalised, and more real…even if it’s virtual. If you don’t hop onto the social media bandwagon now, it will be a rocket ship to Mars by the time you try get on board. Really a great read. Enjoyed it, thank you. Nice to hear your experience in getting to know the SM world. Thank you for being so transparent and honest. Thanks Britt-Lee! Glad you enjoyed it.